Often times, choosing a good monitor for your home studio comes down to your expectations. Some producers will be content with a $500 set of monitors, while others might require something better. Today we’re going to take a look at some of the most capable monitors you can get in the $1000 price range. This is where the real professional gear starts appearing, but also some pleasant surprises. In all honesty, right around a grand is where you will see the best return on your investment. It definitely takes a solid budget to get this mark, but it’s worth it. Despite how bland a set of Neumann KH120A may look, these speakers are considered to be one of the best monitors you can get in this particular price range. Simplicity of design is somewhat of a quality in this case. Neumann has kept things simple on the outside, but when you look at their tolerances, you realize just how high end KH120A is. 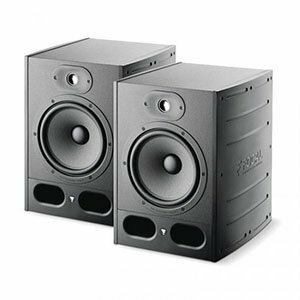 Each speaker is bi amped with 50 Watts of power going to each of the two transducers. Speaking of which, you get a 5.25″ long throw woofer paired with a 1″ titanium fabric dome tweeter. Bass reflex ports are also a thing beauty and they pull the lower end together quite nicely. Overall, it doesn’t get much better in this particular price range. There is something about PreSonus higher end monitors which makes them very attractive. It is hard to pinpoint since on one hand we have extremely attractive aesthetics, on the other an impressive selection of hardware. You could go ahead and say that PreSonus Sceptre S6 is an overall perfect package. With all that said, real fun starts when you turn these on. The main benefit Sceptre S6 bring to the table are the coaxial transducers. Aside from the novelty factor, such a setup offers superior sound field configuration which is important if you are looking for that edge. Full of power, Sceptre S6 are known for their impressive precision and a surprisingly good lower end. Once you figure out your acoustic settings, S6 really start to shine. Focal is by far one of the largest players in the world of high end audio monitoring. Their solutions are known for a good balance of tone, responsiveness and transparency. It just so happens that Focal has decided to devise solutions for the segments of the market they are usually not interested in. The end result of this effort are the Focal Alpha 65. These speakers incorporate everything we love about Focal, but at a much more attainable prices. Cabs are extremely tight and streamlined while all of the components blend together perfectly. You are looking at an aluminum tweeter design which is lightning fast and capable of delivering some serious treble transparency. Combined with the impressive LF driver, Focal Alpha 65 simply offers everything you’d need. This is a high-end bookshelf speaker made by a brand that goes the whole nine yards for every detail. A set like this one gets you impressive sound, great balance and an overall higher level of audio quality. However, that kind of package comes with an adequate price tag. The build quality feels robust in a way you won’t always find with a bookshelf speaker, and they feel every bit a premium product. A combination of innovative and classic design tropes, they will blend well into any room without drawing unnecessary attention. 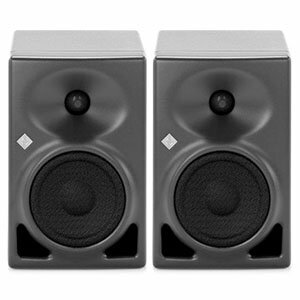 With performance which is about as good as you’re likely to get from bookshelf speakers, these are a fantastic choice if you are in the market for a top of the range product. Compact high end monitors aren’t that easy to find. Most brands have long ditched the idea of mobility in this particular price range. However, there are still some manufacturers who appreciate a good compact set of monitors. 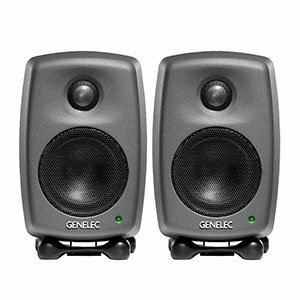 Genelec is one of those and their 8010 monitors fit that image perfectly. Once you get past the simple cabinet design, Genelec 8010 tend to impress. Transducers of choice for this build come down to a 3″ low frequency driver and a 3/4″ tweeter. Despite their small size, both of these transducers are incredibly refined. A powerful Class D bi-amp setup ensures that you get best possible performance. Genelec has chosen XLR as the main input standard, while they’ve also included automatic stand by a bunch of other awesome features. What Makes The $1000 Monitors So Much Better? Designing and building a decent monitor speaker takes a lot of effort. This is partially due to the fact that their application is much different compared to standard consumer speakers. On the other hand, pushing the speaker to achieve 80% of transparency is fairly easy, but covering the remaining 10% or 15% is where most of the time and effort is invested. That’s why you will hear a very significant difference between a $300 monitor speaker and a $1000 one, even if they look pretty much the same. This performance boost can be attributed to several factors. The first thing that comes to mind is the quality of transducers as well as the quality of amplifiers. A vast majority of $1000 monitors will be bi-amped. That is something you don’t often see in cheaper segments of the market. 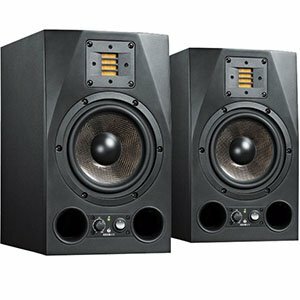 Even though monitors that will cost you a grand aren’t as far as monitoring can go, they are by far some of the best speakers you can get for commercial music production. You will often see some of the more popular professional recording studios use some of the models listed above. Better hardware is almost always going to mean better performance. Especially if the planning and designing phase was executed properly. You would be astonished how much a good waveguide can change the performance of a monitor speaker. It is stuff like this that increases the price of these models. The real question is whether or not you need a $1000 monitor. Every producer will tell you that you should get the best monitors your money can buy. This is absolutely true for a number of reasons. The only situation where you should go for a cheaper option even though you can get an expensive set is if you’re not sure music production is something you want to do long term. Other than that, monitors are the only piece of gear that will give you a true insight into your mix. Without them, a lot of problematic sections of your project could reach the final product completely unseen. That is something no producer wants to deal with, especially if it is significant enough to be heard on the mastered track. Is It Worth Investing That Much in Monitors? When you are just starting out in music production, it can be hard to justify getting an expensive set of monitors. So much so that many newcomers are wondering if it is even necessary to invest in a pair such as those found on our list. To answer these questions we have to look at what high end monitors are designed to do. First thing first, our picks for this guide may seem expensive, but you would be surprised just how far up the price can go on a professional set of monitors. We have barely scratched the surface. Walk into any of the largest professional studios in the world and chances are that you will find custom builds which cost as much as a used car. We are mentioning all of this just so you would have an idea how expensive this whole hobby/profession can get when you go to the extremes. A decent set of $1000 monitors is generally considered to be the sweet spot for anyone looking to go pro. There are numerous reasons why this is the case, but it all generally comes down to raw performance and available features. Although having a big name brand set of monitors is great, the main reason why anyone buys these models is better performance. The real question here is how much better of a performance are we talking about? As it is the case with any product, you reach a point where investing more money into the said product starts to yield diminishing returns. For monitor speakers, that price point is around $1000. Compared to their cheaper counterparts, most of the speakers on our list will give you a significant boost in both clarity and transparency. Then we have the whole issue of sound staging which is very important for proper mix analysis. Just having massive transducers in a box and plenty of power being delivered to them won’t necessarily give you good sound. You also have to count in the design of the cab, design of the waveguides, shielding, acoustic treatment and so many other things. All of these combined are what gets you a good tone. Last but not least we would like to touch upon a rather controversial topic and that is utilizing monitors such as the ones we are talking about today. Music production is a skill that evolves over time. It requires plenty of research, learning but also honing in your ears. 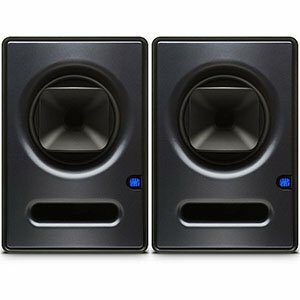 Expensive monitors may sound just like any other pair to a complete beginner, but a pro will definitely notice the difference. In other words, sometimes it is recommended to get the best speakers you can get, but sometimes it might be better to take things slow and work your way up to professional gear. Which of these two paths you’ll take is completely up to you. As long as you do your research, you should be just fine. Investing into a $1000 set of monitors is a big step for many. However, if you’re serious about doing music production in the long run – this is one decision that can boost your performance to a whole new level. Not only will you be able to hear every single subtle detail in your mix, but you will slowly gain a sense of what a proper mix should sound like. The models listed above are some of the most proven monitors you can get in this price range. As such, we definitely recommend them to anyone interested in professional music production.